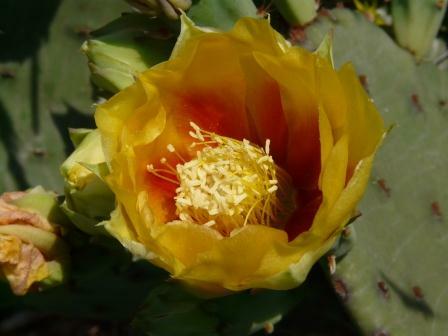 Tennessee’s only native cactus, the prickly pear (Opuntia humifusa) is coming into flower. The flowers stand on top of the fleshy green stems like torches on monuments — an apt comparison in both shape and brilliance of color. The gorgeous intensity of orange and yellow in these flowers is hard to convey. Wow. I feel my wax wings start to melt. This cactus grows in places that are too hot and dry for most other plants: rocky outcrops, dunes, gravel, and thin rocky soil. I found this cluster of plants on the lichen-encrusted sandstone outcrop behind the Fulford Hall parking lot in Sewanee. 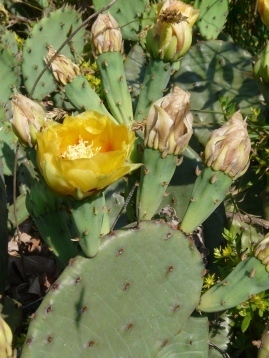 There are dozens of cactus plants there, each one bearing several flowers. I’ve never seen such profusion. Perhaps the long warm spring has suited them. Bumblebees love the flowers. Such is the strength of their desire that several were fighting their way down between the petals of unopened flowers. Later this summer I’ll check the patch again. The pulp of the fat red fruits is edible, although the spines urge caution in this gastronomic quest. 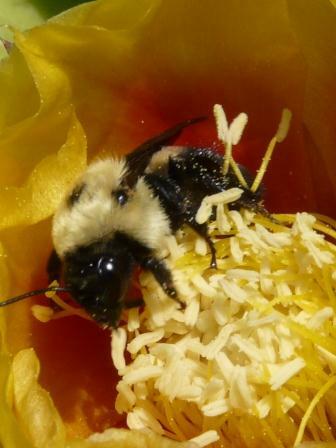 This entry was posted in bumblebees, Plants on May 16, 2012 by David George Haskell. I know where I need to stroll tomorrow, but . . . so many Odonata species appearing at Lake Cheston and so little time! No kidding. In two days, I’ve seen three species I’ve never seen before!